The "Vol Trap" — How Long and How Low the VIX? We've been here before—with the VIX (The CBOE’s Volatility Index) settling in the 10% to 12% range while realized S&P 500 volatility hovers around 6% to 8%. Have you ever seen an ocean smooth and calm like a lake, with gentle waves lapping on the shore? It happens occasionally, and how wonderful it is. We can even let toddlers put their toes in the water. But a calm ocean rarely lulls us into thinking large waves cannot come crashing in again with little or no warning. Weather can change suddenly. So can the markets. I find that weather analogies, such as “turbulent,” “calm,” and “market storm” are handy for explaining market volatility. Those who have heard me speak know one of my favorite phrases: "We don't build our houses for average weather." We build them for the extremes of the climate we live in. And those of us living within two miles of the beach (risk-lovers, some would say), have to build our homes even stronger, and buy costly hurricane insurance to protect against at least a Category 3 "named storm." So here we sit again, with the VIX at around 10% and realized volatility well below that level. We wonder how long this will last. Is it safe to load up on short volatility exposure? Should we buy some downside protection? Is there some fundamental change that means we will not see the VIX above 20% again despite the fact that it has settled there for significant periods in six of the last 10 years? I have been in the "Vol Trap" before and—trust me—there are always surprises. The problem is that it’s very difficult to forecast when change will occur or what will trigger the change. In part, this is because the swing to a higher VIX is related to market psychology. A situation or event triggers a sharp increase in investor risk aversion that lasts at least a month, whereby investors move in concert to take risk off the table. Keep in mind that stock markets globally typically trade about 2% of the value of securities outstanding on an average trading day. Therefore, increased trading activity by risk-reducing investors can lead to sufficient imbalances to move indexes down sharply in a short period. The quick and steep decline is such that risk aversion can feed on itself and wreak havoc on leveraged and high-risk investors as the turbulence shuffles through markets and positions. As recently as May 17, 2017, we had an early warning signal—maybe just heat lightning—of a potential change in market volatility that was a reminder of how quick conditions can change. On that day, as the news of President Trump's team’s Russia connections swirled, we saw some concern that federal tax reform and other business-friendly initiatives of the Trump agenda could be derailed. That day, the VIX spiked and closed at nearly 16%, while the S&P 500 fell 1.8%—a large move in very “calm” waters. But investors moved on with the hope that the Republicans would at least bring less uncertainty (and less regulation) to their earnings prospects and investment plans than they experienced in the Obama years. It is important to look back and realize this has happened before—the extended calm in equity markets interrupted by bursts of a few large daily moves that shifted quickly into a more volatile market. Investors should be paying attention and be prepared so they are not caught in the rush to the exits when the real lightning and turbulence come with the next market storm. Let's look at two prior periods of sustained low VIX levels in the last 15 years and study how long they lasted, how low the VIX got, and where they ended. First, we need to develop a baseline for some of the measures we are talking about. 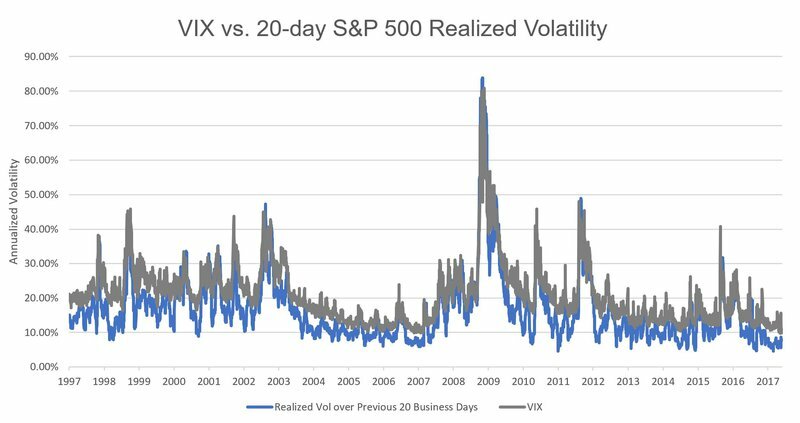 Between January 1997 and January 2017, the VIX averaged 20.9% and volatility over each 20-day period before the VIX was measured averaged 16.6%, a spread of a little over 4%. The VIX looks 30 calendar days out (about 20 trading days), deriving its level from S&P 500 options that expire around that time frame, but the VIX is heavily influenced by the most recent volatility environment. There are a few reasons why the 4% spread between the VIX and realized volatility occurs. To me, the most intuitive one is that when the market is at its stormiest levels, the VIX can peak at over 40% (about 2x its mean), while its lowest level has been just under 10%. Since these storms are hard to predict but do regularly occur (the VIX was over 30% 10 times in the last 20 years), investors are willing to pay for put option exposure that delivers a profit in steep index declines. During these periods, many of their portfolio positions are falling sharply and having the liquidity or “dry powder” from taking a profit on put options can be quite valuable. Such insurance is especially valuable to short-horizon investors with lots of risk on the table. Just like those of us who buy insurance for our hurricane-area homes, these investors consider the need to buy insurance at a premium as part of the cost of living where they do (in the riskier neighborhoods of the markets). There were two prior periods when the VIX settled in at the low end of its range, under 13%, with a low point of around 10%. The first was a rather long one: After the hangover of the three-year bear market of 2000 to 2002, the VIX slipped to the 13% level in November 2004 and stayed subdued until February 2007, over two years. It averaged 12.7% over that period, while realized volatility posted a mean of 9.6%. This also highlights that a low VIX often reflects actual market calm in the recent past, which means that the most obvious catalyst for change is higher realized volatility. The "canary in the coal mine" was heard in February 2007 with the liquidity crisis of Bear Stearns, which came just one week after the VIX hit 10% on February 20, 2007 (realized volatility was around 7% then). The VIX jumped to the 18% to 19% level for about a week but was back down to 12.2% a month later (March 21, 2007). It stayed in the 12% to 17% range through mid-July but then jumped above 20% on July 26, 2007, and with the depth and persistence of the global financial crisis, stayed there for over three years until late 2010. Now, I do hope that none of us sees anything like those very turbulent market conditions of late 2007 to early 2009 again in our lifetime. Unfortunately, I’ve been around the markets long enough to have observed two extreme market storms that surprised me in both their depth and intensity—in 1987 and in 2008. These events, along with the many other “Category 2” and “Category 3” market hurricanes, carry a large weight in contributing to my skeptical and generally cautious market view. A more recent but less dramatic period of unusual calm occurred from January 2013 to July 2014. With a raging bull market in 2013, the VIX averaged 14.0% and fell as low as 10.3% in early July 2013, when 20-day realized volatility dipped to just under 6%. The average realized volatility of 10.4% over this quiet period was also much lower than the long-term average for 20-day realized volatility of 16%. The VIX had a run at 18% by late summer of 2014, and ended up peaking at 26.3% in October of that year. Most troubling in this shift to a higher volatility regime was that no specific trigger could be cited, except that investors were on edge with the Ebola epidemic spreading and U.S. bombing in Syria. Almost a year later, in August 2015, the China currency crisis sent the VIX to levels above 30%, and it stayed above 20% through early October. So, who knows how this 2017 episode of low VIX levels will end? What we are experiencing is not unprecedented and is consistent with the low levels of realized volatility for the S&P 500 that we have seen since the Presidential election in November 2016. The smaller daily moves for broad indexes we have seen of late can be attributed to a shift by investors taking their equity risk more at the company and sector level, since the macro picture is so muddled. Rotation across stocks and sectors increases dispersion, but can keep overall index volatility muted. The good news on the political front for the U.S. corporate sector—less regulatory uncertainty and a higher probability of a more favorable tax environment down the road—are positives that can be exploited by stock investors, but make it hard for a "macro" investor to develop a strategy around. The VIX futures market is always a good barometer of expectations for longer-term uncertainty in U.S. equity markets. What does give me pause is that VIX futures as far out as January 2018 are at the 17% level, well below the 20% long-term average for the VIX. On a seasonal basis, the highest volatility months are typically August to October, and yet the October VIX future is trading around 15% to 16%. I cannot say when the next market storm will come or what the trigger will be. However, I am skeptical that we will remain in these calm waters over the next nine months. Capturing the premium between the VIX and realized S&P 500 volatility is always smart. This year, however, investors would be wise to stay under target for their equity risk allocation and have some downside protection strategies in their tool kit as we move into the late summer and fall months.